Advantages: Knowledgeable contributors, superb artwork, scale plans, full colour photographs, variety of topics. Conclusion: An excellent resource for WWI model enthusiasts. It contains a diverse range of subject matter and the recognized authorities are only too pleased to pass that knowledge on to the reader. Last year’s penultimate issue of Windsock Worldwide has arrived and as always it contains something for everyone. 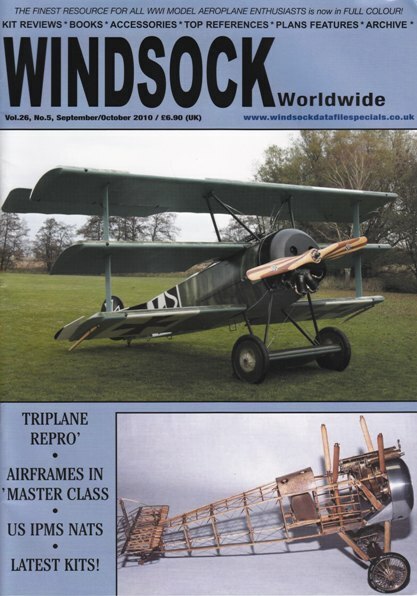 It’s an A4 sized magazine for World War One aviation enthusiasts and promises an eclectic range of material. The popular “Modelling Master Class” series continues and this time Lance Krieg takes a look at airframes. With 7 pages of instructional images and an equally informative narrative, the writer offers plenty of advice on how to improve this highly visible area. The discussion centres on scale considerations, as well as improving the fuselage and flying surfaces. “Rara Avis” will appeal to those looking for something different. This time the BFW N.I comes under the spotlight which was a night bomber powered by a single 260-hp Mercedes D.IVa engine. Only one example was built of this two-seat triplane and the accompanying 1:72 scale plans come from the Ian Stair archives. The customary “Readers’ Gallery” displays the aircraft of avid Windsock readers and more examples can be seen in a report on the IPMS Nationals at the Phoenix Convention Centre. Tom Doherty offers some photo coverage of what must be one of the most meticulous Sopwith Pup reproductions around. The colour images of this flying example contrast nicely with a Swedish Fokker Dr.I in the next article. This is Mikael Carlson’s latest project and like the Pup, also features an original Le Rhône rotary engine. “Archive” showcases some rare post-war images of French WWI aircraft being manufactured and operating in Siam. There are Breguet 14s, Nieuport 17s, and even Spads to be found in the workshops. Definitely interesting diorama material for those so inclined. To whet the appetite of those building the Roden Sopwith triplane, Ronny Bar contributes 3 lovely colour profiles. These are supplemented by close-up photos of the Shuttleworth’s airworthy reproduction and the RAF museum’s Oakley-built twin gun example. The usual comprehensive roundup of reviews completes the publication with a look at the latest kits, books and periodicals. If you have the slightest interest in aircraft from the first “great conflict”, them this is the magazine for you.